The Exit19.pl gift vouchers are an original idea for a remarkable gift! 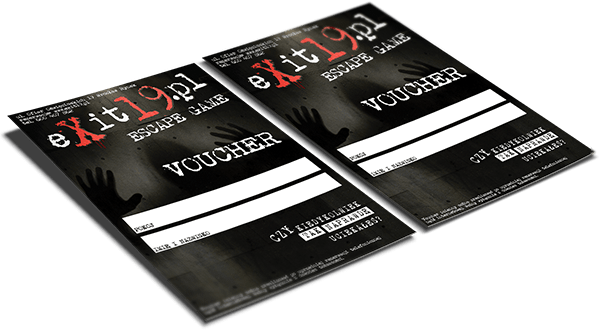 The voucher guarantees the admission to our Escape Rooms at any time (certainly upon a previous reservation of an available date).An elegant and tastefully packed voucher can be purchased in person at the Exit19.pl office (19 Ofiar Oświęcimskich Street, 50-069 Wroclaw), ordered by phone (+48 600 407 862) or by email (rezerwacje@exit19.pl), then the letter will be delivered by courier to the indicated address. If you are not blocking these files, you agree to use them and store in the device memory. Remember that you can independently manage cookies by changing your browser settings.